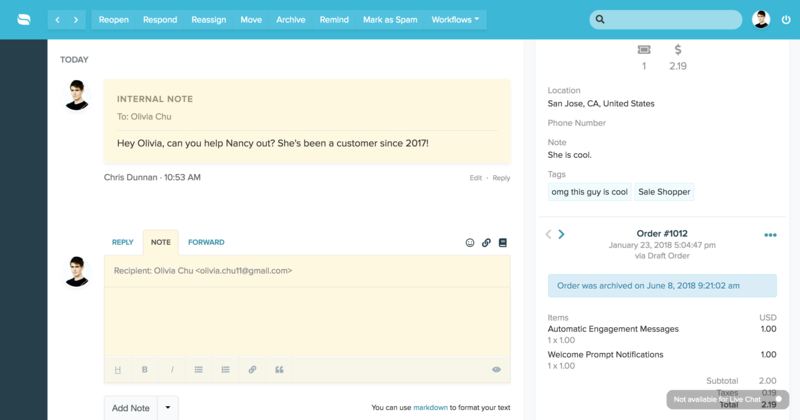 Internal notes are messages sent back and forth between internal team members. These notes usually reside within conversations among messages sent between staff members and customers. For example, if John (a staff member) is talking to Bob (a customer), he can add an internal note addressed to Chris (another staff member) to inquire about some additional information. Chris can easily reply to the internal and that message thread would be threaded within the conversation with Bob. Of course, Bob will never see the back and forth exchange between John and Chris. The exchange is entirely private. There are other ways internal notes can be used. You can leave an internal note even if you're not on the dashboard UI. If you want to leave an internal note via email, you can use the #note syntax preceding the actual message to trigger an internal note event. When you log a new message in Re:amaze, an internal note is essentially created. You can then follow up with the customer as if the customer has initiated the conversation.